We are bringing back Sunday night dinners with the family. Come to our home where we’ll have the talented chef, Natalie Watters, prepare a special meal, courtesy with purchase of your NEWERA Experience Package provided by SAVA, a highly curated cannabis delivery service. Enjoy a delicious three-course vegetarian meal paired to perfection with herb infused products included in your package. During this experience the products purchased in the package will be used to delight and educate attendees. Your package will be delivered to the event beforehand, received by NEWERA representatives, in order to be used during the courtesy meal, with two products remaining to take home at the conclusion of event to use in the comfort of your own home. Use zip code 94111 for the delivery zip code. Once you have selected the NEWERA Experience Package, head over to your shopping cart and check out. If you have not registered with SAVA before, please fill out their registration form and ensure that you select "I am over 21 years of age and do not have a doctor's recommendation" field to move forward through the site. Within Billing Address, include your personal contact details. Package purchase will not incur a delivery fee and will be delivered to the house where experience is located. Contact jessica@neweratribe.com if you have any questions. Location details will be emailed day of the event to those who have purchased a package. Natalie has spent the last year between helping get Tigerlily Restaurant started in Berkeley's Gourmet Ghetto and spending the summer as the Chef at Culitna Lodge and Artist Retreat in Alaska. Prior to that most of her cooking experience has been with San Francisco based catering companies that honor sustainability, local ingredients and seasonal produce. Natalie spent two years cooking in Puerto Rico and loves incorporating tropical flavors to her dishes. She is also highly influenced by her mother cooking traditional Chinese food. HoneyPot Supply (https://www.honeypot.supply/) - HoneyPot is a supplement made with 100% organic, Grade A raw honey, infused with only top shelf strains locally sourced from Northern California. Garden Society (http://www.thegardensociety.com/) - products are chef-inspired, artisan low-dose cannabis confections. Created exclusively from locally grown organic ingredients and responsibly farmed cannabis. Cannabis confections created in Sonoma County, California. Level vape pens (https://www.getsava.com/our-providers/level/) - Level blends produces an array of high-quality cannabis products expertly crafted to achieve desired feeling states. Level scientists apply advanced techniques to unlock the plant’s many benefits and magic. Precisely tune your experience with confidence. Level’s products are always pesticide, solvent, and additive free. Join NEWERA and SAVA, the premier online marketplace for curated cannabis goods, as we bring you a holiday social you'll always remember. This social will be a fun and informative event held in Ghirardelli Square area. Try product samples, ask us your burning cannabis questions, and meet others who are interested in cannabis and wellness. We'll have product samples, interactive art, music to groove to by DJ Fairplay and complimentary beverages, kombucha, delicious tea by Kikoko. This month's special guests - Bloom Farms, Garden Society, Kikoko,Alegría Organic, LaGrandeur, Papa & Barkley, and Kiva Confections. Fully loaded gift bags for the first 50 attendees! It's that time of year for holiday cheer! Join us after the Thanksgiving break to partake in some creative art therapy. 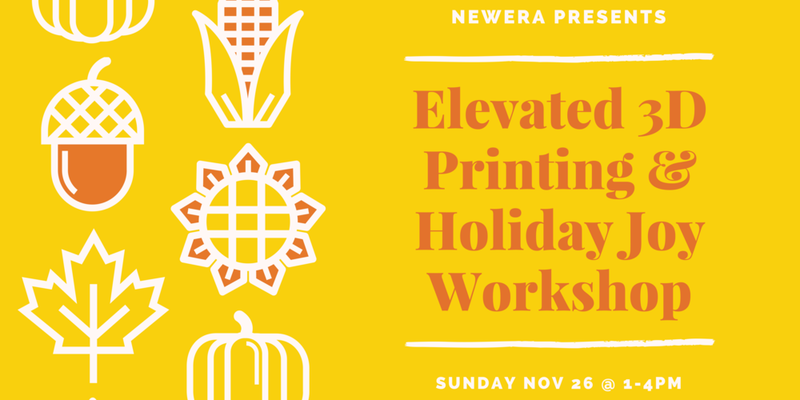 NEWERA is partnering with a the Maker Studio SF team to host a one of a kind event that will start your holiday season on the right note. Within this 3D Printing class attendees will learn introductory skills in TinkerCAD - navigating the space, finding overall shapes - utilizing shapes to create new shapes. Craft a glowing card for friends and family this holiday season with paper circuits - no soldering required! This station will guide attendees on how to create simple paper circuitry using only copper tape, a coin cell battery, a LilyPad Button Board, and an LED, and it will leave you with a basic understanding of how circuits work. During the workshop, we'll also have our Canna Lounge open for those curious about cannabis. Learn how terpenes affect your experience when consuming cannabis, and let our sponsor Kin Slips teach you on how to properly dose yourself for different activities throughout the day. This event is open to adults 21 years or older. There is LIMITED SPACE for this event so make sure you grab your tickets today to ensure attendance. What's included: Materials for two projects, sample of Kin Slips, and Lola Lola vape pens.